At least eight people were killed Friday morning at a shooting at a Houston-area high school. A shooting on Friday morning has claimed the lives of at least 10 people at a high school in Texas. 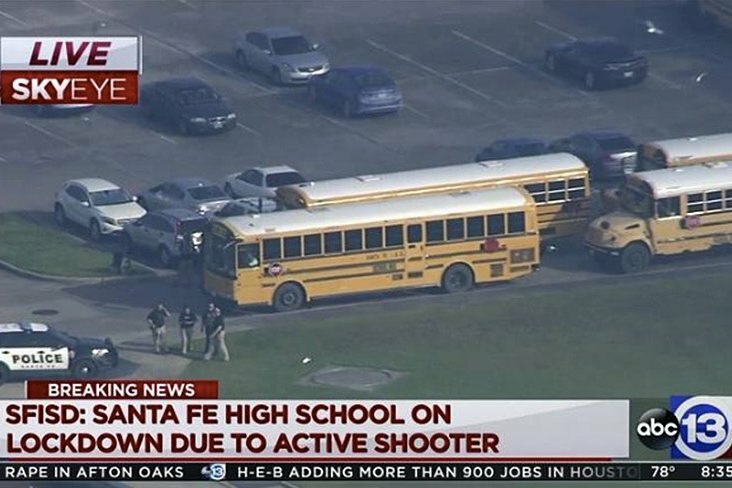 The violent attack occurred at Santa Fe High School in Santa Fe, Texas, about 30 miles southeast of Houston, according to federal and county law enforcement officials. The alleged shooter had multiple guns, including an AR-15, and pipe bombs, the Houston Chronicle reported, citing a senior law enforcement official who was not authorized to speak about the investigation. Nine students and a teacher were dead in the violence, the Chronicle reported. A source told the newspaper said the gunman was a male, but could provide no further information. There were multiple injuries as well, officials said. CNN was reporting that one suspect, identified as a 17-year-old male student, was "in custody" and another was being "detained." The shooter has been "arrested and secured," Assistant Principal Dr. Cris Richardson announced, according to media reports. Two students told KHOU 11 News that their friend saw a kid with a gun and pulled a fire alarm as they fled the campus during the shooting. The shooting comes just three months after 17 people were killed in a school shooting in Parkland, Florida. Student survivors of that shooting have reinvigorated efforts for gun control measures across the country. For continuing coverage of the school shooting, the Houston Chronicle is providing live updates.